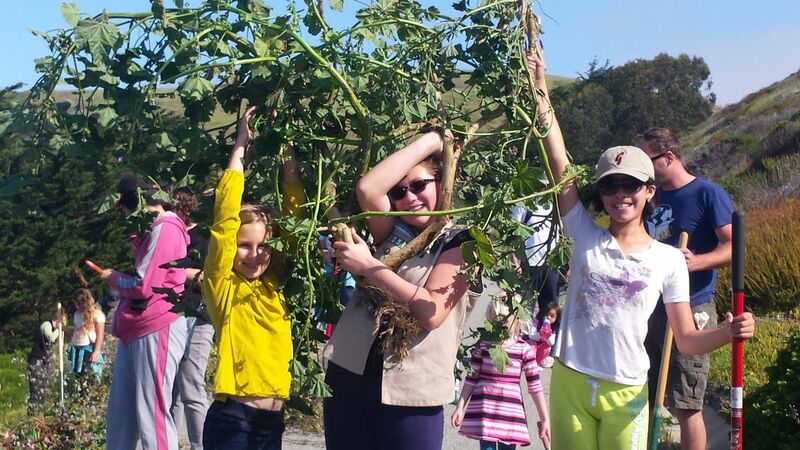 Earth Day Results – 5000 lbs of Trash! YOU ALL WERE BRILLIANT and created a most incredible day for Pacifica, our coast, the bees, and most especially, the environment! From the Schools, to the Action, to the EcoFest, everything was amazing and impactful! We removed less litter (about 25%) and a fraction of the recycling (about 10%) of the amounts that we collected each Earth Day before 2012 from our Pacifica sites; with less litter, we’ve been able to divert many volunteer teams to manage the weedy areas which attract litter. We collected about 30 Cu Yds (used to be 20 yds) of green waste this year from the coastal trail, parking areas, and park sites. As planned, our work is paying off and showing the exact results we envisioned — cleaner cities with more native plants and gardens, less litter, and a community connected and committed to making our cities better. Over 5,000 students learned about bees at their school’s assembly, participated in school cleanups and took action to learn about and help the bees.